Let It Snow [D5189] - $6.00 : Yarn Tree, Your wholesale source for cross stitch supplies. Cross stitch pattern by Silver Creek Samplers. 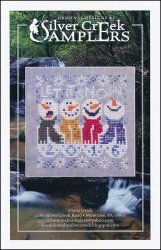 "Let it snow" is stitched above four snowmen accented by snowflakes. The year can be stitched on the snowmen. Stitch count 53 x 54.